I’m not a social media maven, but I listen to what others are doing on twitter and pay attention to their reactions. In a 3 month period, I went from 250 followers, to over 2,300 followers. 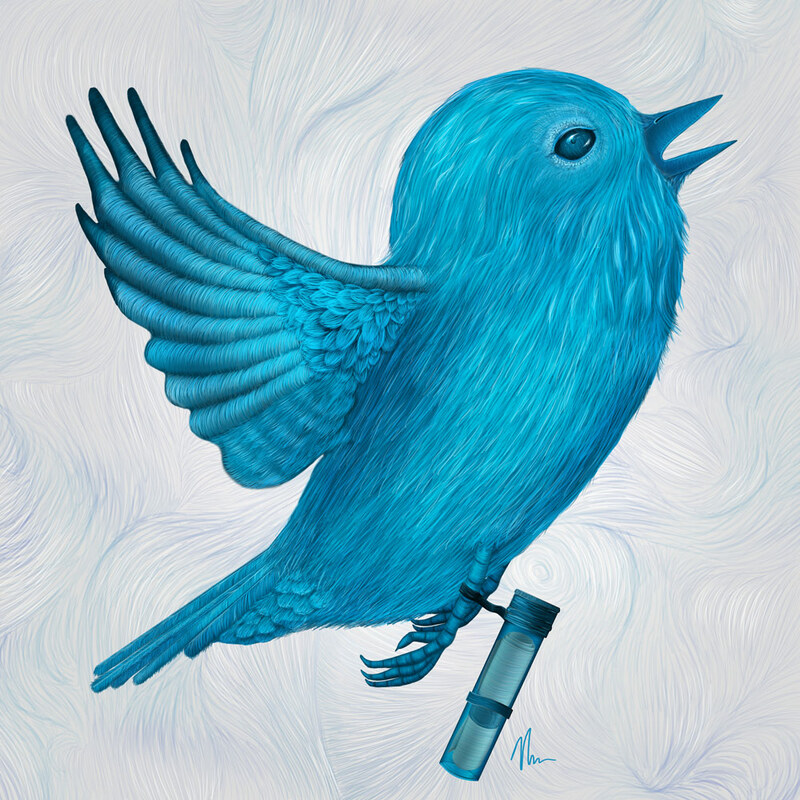 Specifically, I delved into how artists and illustrators are viewed and followed on twitter. These are guidelines I’ve developed over the past few months that I’ve been actively using twitter. This list is certainly not meant to apply to everyone, but has worked for me. 1. Be yourself. Discover what your voice on twitter is, and use that voice 100% of the time in your tweets. Be careful not to appear too negative. Being creative 24/7 can be frustrating, but constantly looking frustrated on your twitter feed appears unprofessional and juvenile. 2. Do follow people you are genuinely interested in. Don’t be afraid to follow too many people. The more you follow, the more likely people are to find you. As an artist, I chose to follow specific museums, magazine and book publishers, art and design blogs, as well as other great artists. 3. Listen to the audience your tweets would apply to, and take note of what others on twitter commonly do, specifically those you look up to in your field. Since I wanted to use twitter primary as an illustrator, I made sure to look at popular twitter accounts by illustrators. Try to find what about his or her feed makes it popular, and see how that might apply to you. 4. Tweet often. I aim to tweet about 3 times in a day about 1 to 3 hours apart. This keeps the twitter feed looking fresh without posting so much that you become annoying to your followers. Be careful not to just post a tweet for the sake of posting. Always talk about, link to, and feature interesting and engaging content. Your tweet is like a headline. If it’s not interesting enough, it will be ignored. When perusing twitter, I looked for tweets with amazing images or art projects which mentioned the artist. If I found the work truly inspiring, I would tweet the link or image with a sentence on what it was about and what my opinion of the work was. As a courtesy, I would also mention the original artist in my tweet. Promoting other great artists is a good practice. Any artist greatly appreciates when you help promote his or her work. It may also spark a great conversation with the artist. 5. Make sure to self-promote as well as interact with other people. This is a social media website that spurs communication, not a one-way radio broadcast. Self-promotion may be your end goal, but shamelessly promoting too often can turn people off. Try linking to an informative blog post you wrote. As an artist, I try to explain my art process whenever possible. It will help other artists and can help establish you as a knowledgeable person on the subject. For example, create a “How-to” video showing how you got to your finished artwork. 6. Mention people in tweets you would like to talk to about something specific. Randomly adding people to a tweet will look like spam. Engage with everyone that mentions you, whether it was a good comment, a bad comment or a question. Selectively engage with people who favorite your tweets. Clearly they liked what you said, they may be open to having a conversation with you. As a general guideline, try to think more about having meaningful conversations and less about making a sale. It will help you look more personable and human. 7. Mention topics in a tweet. Topics are also commonly referred to as hash-tags, and look like this, #art. Make sure the topics you choose are relevant to what you are talking about. Randomly tacking on every buzz topic you’ve heard will also look like spam. Try to limit it to 3 topics at the most. As an illustrator, I used topics like #illustration, #painting, and #art. These may seem very obvious, but once I started using topics appropriately in my tweets, it made a huge difference. 8. Avoid grammatical errors whenever possible and try to tweet using complete sentences. It will help make your twitter feed look more professional. 9. Make lists of twitter accounts you find yourself constantly going back to. For example, I made a list of my favorite twitter feeds by illustrators, and titled it Inspiring Illustrators. 10. Aim to get real twitter followers, not mindless, inactive robots. Be conscious that many twitter accounts you see are fake. They are either represented by companies to gain a bigger follower base or are hackers attempting to gain personal information and/or access to your twitter account. This becomes more apparent when you look at an account that’s followed by thousands or millions of people. Many of those followers aren’t attached to an account with a real person. For example, a twitter account with many followers but no tweets, may be a robot. A twitter account that only retweets from other accounts and has no original content, may also be a robot. On a softer note, try not to obsesses about people who unfollow you. People can choose who to follow and who to not follow based on what someone has in their twitter feed. It is just honesty. Please don’t hate them for it. I hope this list helps you be more successful on twitter. Good luck! If you have any questions, comments, or feedback, please use the comment field below. Portfolio’s are fickle beasts. Deciding what to put in, what to pull out, and how to present it is difficult. It requires that an artist review his or her work objectively. Portfolio websites are no different. They require constant feedback and updates to keep them looking their best. Any one piece that is not up to the caliber of the other work included brings down the quality of the portfolio as a whole. A great portfolio intrigues the viewer, keeping him or her interested and wanting more.